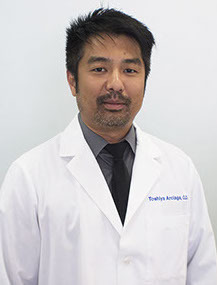 Home » Our Doctors » Toshiya Arciaga, O.D. Dr. Toshiya Arciaga was born in Japan. His father served in the United States Navy and was stationed in Japan for almost two decades. Upon graduating high school in Misawa, Japan, he continued his studies and received his Bachelor’s of Science degree in Biology from the University of West Florida. He earned his Doctor of Optometry degree in 2003 from Illinois College of Optometry in Chicago. Dr. Arciaga is well-trained in ocular disease and in contact lenses. While attending ICO, he successfully completed ocular disease internships at Illinois Eye Institute in Chicago and Louis Stokes Cleveland VA Medical Center in Cleveland. A low vision internship was also completed at Louis Stokes Cleveland VA Medical Center. A primary care internship was also completed at Tyndall Air Force Base in Panama City, Florida and Lake City VA Medical Center in Lake City, Florida. Dr. Arciaga is committed to providing quality eye care to the needy around the world. Over the past 10 years, he has traveled to Nicaragua, Honduras, Paraguay, Mexico, Gambia, Kenya, Tanzania, South Africa, China, Indonesia, Malaysia, and India to deliver free eye care with OneSight. He has also volunteered locally in Tampa, St Petersburg, and Clearwater to provide free eye care. He is also an active member of ALLDocs. Dr. Arciaga enjoys spending time and traveling with his wife and two boys.